This magnificent ladies filigree Celtic ring is made from sterling silver with a yellow gold plating on the Trinity Knots. The Trinity Knot is also present on the ring and in Christianity was said to represent the Father, the Son and the Holy Spirit. It was also said to represent the physical, the mental and the spiritual. Its never ending design was believed to be a symbol of eternal life. A beautiful gift for someone you love. 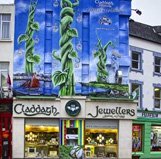 Claddagh Jewellers – The Irish Jewellery Specialists - From Galway with Love!